We continue our Presidential Geography series, an examination of each state’s political landscape and how it’s changing. Here is North Dakota, the Peace Garden State. FiveThirtyEight spoke with Mark S. Jendrysik and Dana Harsell, both professors of political science at the University of North Dakota. The recipe for Democratic success in North Dakota, a Republican-leaning state, has long been the same: be personable, be moderate and champion the farm. But a new ingredient, Bakken shale oil, has recently been added to the state’s partisan mix. The boom in oil in western North Dakota may solidify the Republican hold on the state, or it could stir voters to take another look at Democratic policies. North Dakota is a conservative state. It has been carried by Democrats just five times in 30 presidential elections. The state’s electorate is relatively old, predominantly white and socially conservative. Yet Democrats have been able to compete and even thrive here, just as they have in South Dakota. North Dakota, a place with agrarian roots and a small population (roughly 684,000), has been particularly friendly to Democrats in elections for the United States Senate and House. 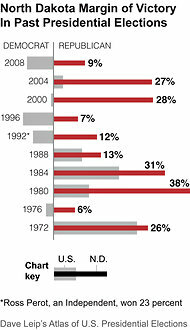 From 1987 to 2010, North Dakota had an all-Democratic Congressional delegation. Historically, farmers — at the mercy of commodity prices, the railroads, the banks, the weather and more — would turn to collective action and government for protection and stability. That impulse helped give rise to the Nonpartisan League, which was founded in 1915 by a former Socialist Party organizer. The league called for a state-owned bank and a state-owned grain elevator and mill (North Dakota still has all three). In 1956, the Nonpartisan League merged with the state’s Democratic Party, and for years North Dakota’s streak of agrarian populism allowed Democrats to win elections. The state’s recent Democratic politicians — Senator Kent Conrad, former Senator Byron Dorgan and former Representative Earl Pomeroy — were cut from this tradition. As that populist streak has faded, so has the Democratic Party. In the last decade, Mr. Jendrysik said, Republicans have “pretty much wiped the Democrats out in the legislature, and in terms of statewide offices, they’ve pretty much wiped the Democrats out there too.” Mr. Pomeroy lost re-election in 2010. Mr. Dorgan retired. Mr. Conrad is retiring. Democrats are now limited to competing in the cities of eastern North Dakota, in Fargo and Grand Forks, as well as the state’s American Indian reservations. Democrats win solid majorities in counties dominated by reservations, but in Grand Forks County and Cass County, where Fargo is, Mr. Obama managed only slim victories in 2008, of 5 and 7 percentage points respectively. As you travel west, North Dakota becomes less populated and more conservative. Mr. McCain carried almost every county in western North Dakota, including the main population center in the west, Bismarck, with 61 percent of the vote. The oil bonanza is taking place west and northwest of Bismarck, and the scale is staggering. This year alone, North Dakota overtook California and then Alaska to become the nation’s second biggest producer of petroleum, behind only Texas. Six years ago North Dakota ranked ninth. The oil rush has had a profound effect on the state. Incomes have surged in oil-producing counties, and the state’s general fund is flush with cash from new tax revenues. 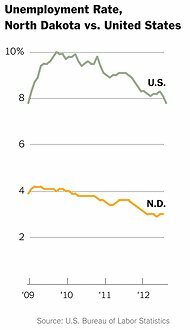 North Dakota was left virtually untouched by the recession; the state’s unemployment rate steadily fell throughout. In August, the last month for which data is available, North Dakota had the nation’s lowest jobless rate, 3 percent, according to the Bureau of Labor Statistics. But the influx of oil workers has strained infrastructure. Housing is in short supply, giant trucks are tearing up roads and pollution has become a concern. Richland County, in the southeast corner of North Dakota, has been an imperfect bellwether in the last three president elections. It was two percentage points more Democratic-leaning than the state in 2008. But it was a bit more Republican-leaning than the state in 2004 and 2000. Mr. Romney is a 100 percent favorite in North Dakota, according to the current FiveThirtyEight forecast, and the presidential race is unlikely to receive much attention there. Instead, North Dakota’s Senate race is center stage, and it may provide an early clue as to how the Bakken oil rush will influence North Dakota politics. Both Representative Rick Berg, a Republican, and Democrat Heidi Heitkamp have come out in favor of across-the-board energy development, including the Keystone pipeline. On the other hand, there are energy issues more favorable to the Democratic brand. The oil rush — specifically hydraulic fracturing and the flaring of natural gas — has raised environmental concerns, and “a lot of North Dakotans are proud of their environmental heritage and the land around them,” Mr. Harsell said. In addition, a distrust of outsiders that was baked into the state by the experience of farmers could be reawakened. “Big Oil is owned by outside interests,” Mr. Harsell said. How North Dakotans weigh the pros and cons of an oil-saturated economy will partly dictate the effect the Bakken rush has on state politics. This year’s senate race may provide an early indication whether North Dakotan Democrats can still maintain identities distinct from national Democrats. According to the current FiveThirtyEight forecast, the Republican, Mr. Berg, is a 77 percent favorite.